Here’s a fun little survey: choose your 10 favorite songs of 1962! The Grooveyard holds frequent surveys for your favorite oldies and through October 17th, it’s our year. Choose from greats like Monster Mash, featured here last week, Big Girls Don't Cry, Johnny Angel, Palisades Park, or of course, The Twist. If you don’t see your favorites, they have a write-in box, which I used when I voted. Before all the colors slip away, get out on the road somewhere! The U.S. Forest Service has a handy set of 2013 Fall Colors Webpages to help you plan. And besides showing where the color is in various national forests, they also have information on fall wildflowers, satellite images, and information on the science of leaves changing colors. Best of all, even though much of the federal government is shut down right now, this site is not! Many states have their own pages to help you find good fall color in more detail. Check these out. Spaceball demonstration, Paris, 1965, with George Nissen, Tim Blake, and Pat Winkle (Photo by Tim Blake, from Wikimedia Commons, licensed under the Creative Commons Attribution 3.0 Unported license.). You may have thought that skydiving was an obscure sport when I reported on it last week. But today, I go even farther out of the mainstream with Spaceball! Spaceball is a game for two played on a specially-designed trampoline. It was invented in 1962 by George Nissen of the Nissen Trampoline Company of Cedar Rapids, Iowa. George had previously invented the modern trampoline and his dream was to create a trampoline-based sport for the Olympic Games. He eventually saw his dream come true, when competitive trampolining (though not Spaceball) was added as an Olympic event in 2000. The game allows you to bounce not only off the floor but also off the backboards of the trampoline. The goal is to throw the ball through the center basket in a way which makes the opponent drop the ball, awarding you a point. Many people say it gives you a zero gravity feeling and indeed, NASA Astronauts played Spaceball for exercise to condition their bodies for space travel. Back near the beginning of our US-6 trip, we stopped at the Sandwich Glass Museum in Sandwich, Massachusetts. The museum has been here for over a hundred years, making it one of the oldest museums on our journey. The museum collection includes mold-blown, pressed, cut and even engraved glass. Most is from the period 1810-1888, when the Boston & Sandwich Glass Company operated here. Other firms in the area continued with smaller scale glass manufacturing. But by the 1920s, the entire glass industry in Sandwich had ended and the factory buildings were slowly demolished. By 1944, there was barely a trace of any buildings and in 1962 the museum was all that remained. Besides their collection you can now watch glassmakers blow glass by hand at the furnace and purchase souvenirs. Television-based comics were popular in 1962. 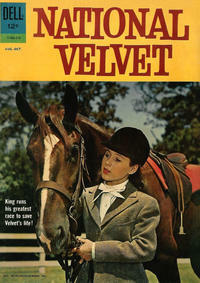 Dell’s “National Velvet” was based on the NBC TV show of the same name that was broadcast for fifty-eight episodes from 1960 to 1962. The comic was not as successful, having only six issues from 1961 to 1963. On the television show, the lead character Velvet Brown was played by Lori Martin. She had been played by Elizabeth Taylor in the movie version in the 1940s, but of course Ms. Taylor was playing adult roles such as Cleopatra by 1962. Brady's Bunch of Lorain County Nostalgia is a fantastic resource for old things, places, and people in Lorain County, Ohio and nearby. I referenced it heavily when writing my latest post about traveling US-6 along the Lake Erie shore. Dan Brady writes in a fun tone that almost makes you think you were there in the 1950s, 60s and 70s. And Dan’s a great guy who shares photos too! This week, I’m looking back close to home in mid-Michigan. The Day 5 segment of US-23 is one that I drive frequently and I’m always seeing bits and pieces from an earlier time. Though a freeway has been built on top of the old road for part of the way, you can still get off and travel much of the two-lane road through small towns and farmlands. And if you want a big city, wander around Ann Arbor to see some museums and gardens that were there in 1962. I have a new post up for our roadtrip down US-6. Day 14 takes a drive along Ohio’s Lake Erie coast, and a look at the coast as both a vacationland and industrial area in the past. Much of the industry has been demolished and the mom-and-pop resort properties closed up, but the parks and beaches are still beautiful. There’s also good food to be had and plenty of history, so come along with me. Speaking of Elizabeth Taylor in the epic Cleopatra, here’s a look at what else was happening in the movie industry in 1962. I discuss movies of the year, celebrities, trends, and of course, drive-ins. John Wayne appeared in three movies and Elvis Presley was in two movies that year. The first James Bond film was released, Marilyn Monroe died, and Robert Redford made his film debut. Also, the first multiple screen theater opened and censorship was an issue. Read more on Roadtrip-’62 ™. Here’s one of my favorite songs from 1962 that doesn’t appear on the survey list at Grooveyard Greats. The Vince Guaraldi Trio’s “Cast Your Fate To The Wind”. Yes, this is the same jazz trio that recorded all the music for the early Peanuts TV specials and you can hear the same stylings in this song. - October 23-27, 2013. This festival began in 1962 with some pumpkin decorating and has grown into a huge event. There will be over 1000 entries in the Decorated Pumpkin Display, 2 carnivals, 2 indoor craft shows, and a parade on Sunday.